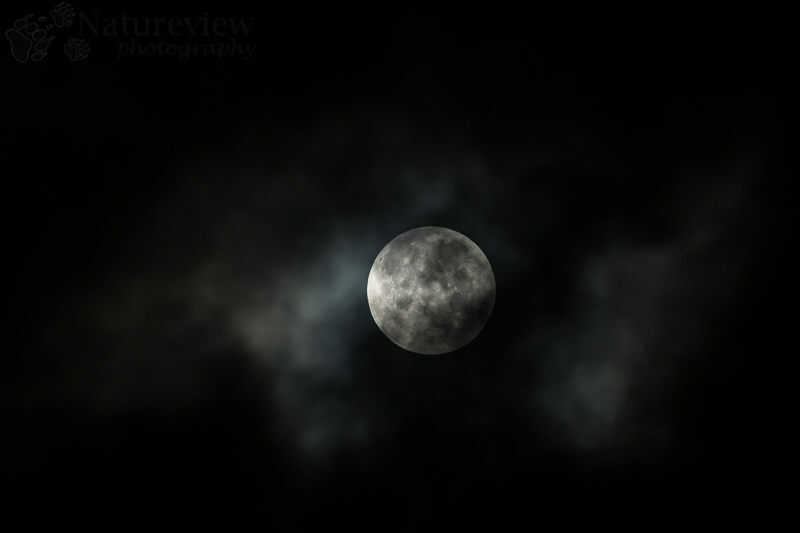 For me this is the image for last nights Lunar eclipse: a full moon partly covered by clouds. Conditions were reasonable good, right up to the moment when the Moon hit the Earth’s shadow. A couple of minutes before this happened, a thick layer of clouds appeared and that was the end of the visibility for me… During totality a few very tiny gaps appeared and I had some one second long views of the blood-red moon, but I didn’t manage to get any decent shots. Shortly after the totality ended and even the small gaps had disappeared again, it was around 6 a.m., I decided to call it a day and grab a few hours of sleep… This makes me even more grateful for the stunning weather we had during the Solar eclipse on Spitsbergen. But I would have loved to make a similar image as I had from the Solar eclipse… Well, you can’t have it all, can you?